Just as in humans, infectious diseases occur in dogs when they come into contact with harmful viruses or bacteria. These diseases can be debilitating, and many of them are fatal. Many infectious diseases can be prevented through a good vaccination program. Vaccines work the same way in dogs as they do in people. When a safely altered virus or bacteria is given to an animal, the immune system responds by producing protective antibodies. These circulate in the blood and protect against the actual disease. While it is true that many canine infectious diseases occur in puppies, dogs of all ages are candidates for infection. As soon as you introduce a new dog into your home, contact your veterinarian to determine the best schedule for their vaccinations. Most diseases we vaccinate for are specific to dogs and cats, there are some that are zoonotic (can be transmitted from dogs to humans). For example, Rabies and Leptospirosis. Puppies receive vaccinations at regular intervals to ensure adequate immunity. If the vaccinations are not administered at the proper intervals or age, (i.e., intervals longer than recommended or too young when administered) then immunity cannot be reasonably assured. Generally, puppies and kittens begin their vaccination regime between 6-8 weeks of age and the interval time is 21-28 days between boosters until the appropriate age and number of booster vaccinations has been reached. We recommend that you do not bring your pet for walks, to parks or expose them to animals with unknown vaccine history until their vaccination schedule has been completed. (For puppies, this is generally after the 16-18 week mark). After their initial vaccinations series, dogs and cats require yearly physical examinations and vaccinations to continue protection against these diseases. It is not unusual to detect some lethargy in the 12-24 hours following vaccinations. More severe reactions to vaccinations can occur. These are extremely rare and usually manifest as vomiting, diarrhea or severe lethargy in the hour after vaccinations. Occasionally, a thickening or lump formation may occur at the vaccination site. If this is painful or persists for more than a week or so with no decrease in size, please do not hesitate to give us a call. In rare instances, a few dogs will develop more severe reactions that are forms of hypersensitivity or allergic reactions. These will usually occur within minutes but may be delayed for a few hours. The dog may have swelling, difficulty breathing, salivate, vomit or have diarrhea. In these situations, call us immediately. With the rarity of these instances, the protection offered by vaccinating your pet far outweighs the potential risks associated with it. If your pet has had a reaction, we will take steps to ensure this will not happen again. If you have concerns or questions regarding vaccinating your pet, please give us a call so we can discuss them with you. Nearly every dog is exposed to this disease in their lifetime and when infection occurs, it is often fatal. Distemper attacks many organs in the body including the nervous system. Symptoms include: listlessness, fever, coughing, diarrhea, vomiting, discharge from the eyes and nose, convulsions and paralysis. This disease is highly contagious and fatal if left untreated. The virus, which is particularly resistant, is spread mainly through feces. Symptoms include: high fever, listlessness, vomiting and diarrhea which will lead to shock and be fatal. Vaccination is highly effective and is the best way to protect your dog. This is a bacterial disease that attacks the dog’s kidneys and liver. Infection occurs through contact with the urine of infected dogs, rats and wildlife, for example, puddles, marshes, ditches, etc., that have been contaminated by wildlife. It is particularly prevalent in the raccoon population in South Western Ontario. Symptoms can be severe and include: loss of appetite, fever, jaundice, internal bleeding, lethargy. This highly contagious disase can cause inflammation of the trachea and bronchi. It can be caused by different airborne viruses and bacteria. The most common among these are canine Parainfluenza virus, Canine Adenovirus and Bordetella Bronchiseptica. The disease is characterized by a dry cough. Dogs do not have to be in direct contact with each other in order to transmit this disease. This vaccine is recommended for any patient who goes to a grooming facility, goes to pet stores frequently or the dog park and is mandatory for most kennels and boarding facilities. Panleukopenia virus is generally widespread and natural exposure is common. Symptoms include fever, loss of appetite, vomiting, depression, diarrhea, dehydration and other complications that can result in fatalities. This is the most severe and widespread upper respiratory virus to which cats are susceptible. It is very serious is young kittens, but all ages are at risk. Symtoms include moderate fever, tearing, discharge from the eyes and nose, mouth breathing, sneezing, coughing and salivation. Treatment is difficult and limited to treating the symptoms of the disease. Recovered cats can be carriers for life and can shed the virus intermittently, especially when stressed. This is another major upper respiratory virus. It is widespread, highly contagious and accounts for about 40% of respiratory disease in cats. Symptoms include moderate fever, pneumonia, ulcers or blisters on the tongue. Treatment is difficult and limited to treating the symptoms of the disease. Recovered cats can be carriers for life and can shed the virus intermittently, especially when stressed. This is directly responsible for 15-20% of all feline respiratory disease. It is extremely contagious, especially in kittens, and the morbidity rate is extremely high. This causes infection in the conjunctival membrane of the eyes. Symptoms include mild to severe conjunctivitis, excessive tearing, sneezing, heavy salivation and coughing. This disease can be transmitted from a mother to her offspring before birth as well as through milk while kittens are nursing. It is primarily transmitted through cats that are in close contact, groom each other, share food and water bowls for prolonged periods of time. This virus can be present with non-specific signs such as appetence, lethargy and weight loss. The virus can induce an immune deficiency similar to HIV in humans, where the cat has difficulty fighting off other bacterial, viral, fungal or parasitic diseases. 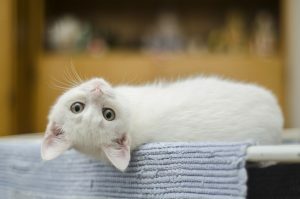 This is common and can easily go unnoticed for years as the cat experiences an unusual number of severe, seemingly unrelated conditions such as respiratory infections, tooth and gum disease, fever of unknown origin, diarrhea, abscesses, urinary tract infections and enlarged lymph nodes. They can cause anemia (low red blood cell numbers) as well as cancers of the lymphoid tissues and bone marrow. It is recommended that all kittens, as well as cats who go outside or cats that live with cats that go outside be vaccinated against this disease. The rabies virus attacks the nervous system resulting in a fatal disease. Rabies is transmitted through bites or scratches from other animals, the most common being bats, foxes, and skunks. All mammals are susceptible to the infection, including humans. Rabies is a major health hazard, so it is required, by law to have your cat or dog vaccinated against this disease.